The Nintendo DS universe refers to the Super Smash Bros. series' collection of stages and properties that hail from the default software on Nintendo's Nintendo DS handheld video game system. 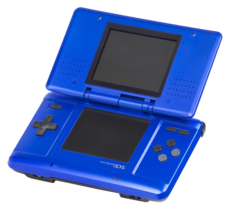 The Nintendo DS is recognized as its own universe by Super Smash Bros. Brawl. PictoChat: Based off of the PictoChat software built into every Nintendo DS, this stage evokes the whimsical doodling element of the software. While it is, at its base form, a completely flat stage, scenery and new elements are quickly drawn onto the stage and then erased and replaced as quickly as they appear, creating an ever changing battlefield. PictoChat: An original composition featuring Nintendo DS and Wii menu sound effects. The Nintendo DS universe makes a return in Super Smash Bros. for Nintendo 3DS. While the original PictoChat stage does not appear, it is replaced by a similar, updated version. PictoChat 2 : A new stage similar to the previous PictoChat, featuring different drawings which introduce new stage elements. PictoChat: Returns unchanged from Brawl. This plays on PictoChat 2 in the 3DS version and 75m in the Wii U version. PictoChat 2: Returns as a retro stage. "PictoChat": An original, piano-based theme, featuring sound effects from the Nintendo DS and Nintendo DS Lite menu, the Wii menu, and PictoChat. Returns from Brawl. This page was last edited on April 13, 2019, at 18:47.